White mustard seeds are hard round seeds, usually around 1.0 to 1.5 mm (0.039 to 0.059 in) in diameter, with a color ranging from beige or yellow to light brown. They can be used whole for pickling or toasted for use in dishes. When ground and mixed with other ingredients, a paste or more standard condiment can be produced. Add 10 cloves of garlic (crushed). Mix. Add 2 ½ heaping teaspoons of white wheat flour. Mix. Add 3/4 cup of wine vinegar. Mix. ↑ Beesley, S. and Wilde, J. 1997. Urban Flora of Belfast. The Institute of Irish Studies and The Queen's University of Belfast. ISBN 0-85389-695-X. ↑ Balke, D. (2000). 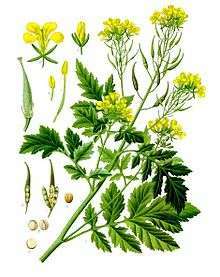 "Rapid aqueous extraction of mucilage from whole white mustard seed". Food Research International. 33 (5): 347–356. doi:10.1016/S0963-9969(00)00055-7.